As you guys have surely noticed by now, there’s a lot that goes into making a dress shoe – and there are a lot of dress shoe styles out there. Meaning? Decisions around footwear can get complicated in a hurry. Don’t let dress shoe decision fatigue cripple a potentially stellar outfit; just reference the guide below to know which shoes to wear with what (and when). The capstone shoe of business or formalwear makes these a must-have in any gentleman’s closet. Traditionally of the more formal footwear family, the oxford (or balmoral) is known for its closed lacing system and streamlined aesthetic – a function of its vamp stitched on top of the quarters and often-hidden eyelets. When tight tied, there’s no visible gap between the lace flaps. The lowdown: Often brogued, the wingtip is distinguished by the winged extension on the toe cap forming a W shape. From any corporate meeting, formal events, and dapper dinner dates – the oxford is appropriate for any occasion where you’re donning a suit. While a sartorial pairing is certainly the safe zone of styling these, you can dress oxfords down slightly. If paired with denim, choose a dark wash and keep the rest of the look more buttoned up with a tucked-in shirt, tie, and blazer or sleek outerwear of choice that could also be worn with trousers. An ideal day-to-night staple you can incorporate into a large variety of looks. Sometimes referred to as a blucher, a derby shoe separates itself from an oxford by its often-present front-facing eyelets and an open front. The quarters are stitched on top of the vamp creating an open lacing system that’s identifiable by the slight gap at the lace flaps when the laces are fully tied. The derby is the hallmark of business or smart casual attire – making them a prime candidate for bold styling choices. Easily paired with both jeans, chinos, and casual suits, the success of a derby is all in the details of your look. Make sure you’re look isn’t jeans-and-a-tee casual and save your finest wool suit at a corporate event for your oxfords instead. This classy-casual footwear has been an off-duty pick for stylish men for decades…with no sign of slowing down. The loafer is defined by its lack of buckles or laces and ability to translate from work to play – with socks definitely being optional. Known, of course, for its slip-on nature, a loafer has a decidedly different feel from its distant cousins: the moccasin and slipper. A moccasin, with its flexible sole and laces (decorative or functional) leans casual, best worn with jeans or chinos, while a slipper, derived from a formal pump and found often in patent leather, suede, or even velvet, lends the wearer a dressier vibe. The lowdown: Quite literally made for its namesake to fit in the front slot, the penny loafer has grown in popularity with each decade – worn by icons from James Dean to Michael Jackson. The lowdown: Both tassel and bit loafers are the dressier alternative to this comfortable shoe’s more casual reputation. 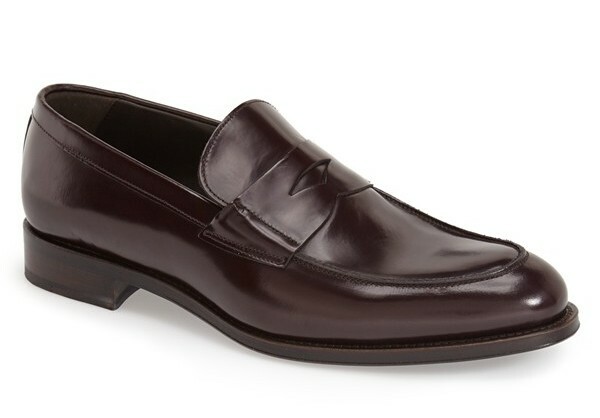 A loafer is best reserved for traditionally casual situations and ensembles. While you can absolutely pair a tasseled loafer with your navy suit at the office, it’s best to keep your penny loafers with casual suits, chinos, or jeans. All three loafer types can work well when paired with trousers, a crisp shirt, and either a casual sportcoat or better yet, a cardigan. A long-standing staple that continues to make its name in menswear as a versatile option. The monk strap can easily be spotted in the wild, identifiable by the quarters of the upper overlapping the vamp and clasped by a single or double buckle – not a lace in sight. Crafted in the manner of an oxford, a monk strap shoe is arguably equal in ranks of formality. You can think of your monk straps – double or single – as an alternate option to oxfords when incorporating them into your wardrobe. There are certainly some menswear mavens stretching monks into more casual looks, but this is a tricker feat. If you’re just starting to wear monks, keep them to dressier outfits. The only caveat? Suede monks can level-up any business casual look while not looking too formal. WHICH DRESS SHOE STYLE DO YOU LEAN TOWARD? WHAT’S YOUR FAVORITE WAY TO STYLE THEM? Don’t forget to check out the latest episode of the Undressed podcast!